Several times as an associate pastor, I have walked through the valley of the shadow of a change in lead pastor. It is inevitable for all of us who stay in the role long enough. Lead pastors announce their intention to retire, get called to new ministries, or receive the call from their District Superintendent many in my United Methodist denomination dread, announcing the bishop’s intention to appoint them to a new congregation at Annual Conference. This is an uneasy time for the entire congregation, and can be doubly stressful on the staff as each member begins to wonder about his or her job security. As an associate you can hope to survive or choose to thrive in this period of transition. As the season of pastoral change approaches, Seedbed Publishing has released a new resource authored by Robert Kaylor, the lead pastor with whom I serve. 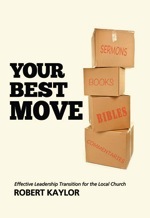 His new book, Your Best Move: Effective Leadership Transition in the Local Church, and companion webinar “Your Next Move: Planning for Clergy Transitions” (available April 27) are designed to help churches and pastors navigate the tricky waters of a pastoral transition. We associates experience the transition a little differently than the congregation or the pastors making the moves in and out of the church. In this first of two parts, I offer some tips on how to respond to the announcement of a pastoral change, and some strategies as the current pastor’s tenure winds down. Provide a non-anxious presence – When the announcement of the impending transition is made, the anxiety in the congregation will be high. The uncertainty will be overwhelming. There will be questions about next steps, who the next pastor will be, whether we can trust the bishop or search committee to provide us with the “right” pastor, and so much more. Your non-anxious presence will be a great value to everyone involved – the transition team, the outgoing pastor, and every member of the congregation. In all of your dealings you must project the words St. Julian of Norwich reported were given to her from God, “All shall be well, and all shall be well, and all manner of thing shall be well.” If the congregation senses your trust that “all shall be well,” they will be able to relax, and trust in God for the future of their church. Focus – Let’s face it though, you might not be sure everything will be well. You and I have both heard stories about the new pastor coming in and disassembling the staff almost immediately upon arrival. You are frightened for your job. You could choose to spend a great deal of your time worrying about your job security, but Jesus taught our worry cannot add a single hour to our lives (Matthew 6:27) or our current employment. Choose instead to combat your fears by using your position and giftedness to help the congregation you serve through this uncertain time. In the end, your leadership will demonstrate your value to your congregation and the new lead pastor – both of which will raise the odds you will keep your job anyway. Shift your focus off yourself, and back toward the flock you have been called to shepherd. It will do both of you a lot of good. Acknowledge the congregation’s grief – Transitions are hard. The pastor is leaving, and won’t be returning. He or she has been with members of the congregation through weddings, births, funerals, divorces, graduations, retirement parties, surgeries, illnesses, holidays, confirmations, job losses, deployments, and many other highs and lows of life. This individual has been important to so many, and that time is coming to a close. People are grieved over the loss to come. While you are projecting the non-anxious presence, be sure to acknowledge the pain and suffering. All shall be well, but right now it is not. Let people grieve. Validate their grief. Walk through it with them. Acknowledge your own feelings – You also may be deeply grieved to lose the leader of the congregation. On the other hand, you may be thrilled to be moving out from under a leadership style you have not appreciated. Get in touch with what you are feeling by talking to your spouse or a colleague. The reason I suggest you do this intentionally is so you do not do it inadvertently with members of your congregation. Whether you are grieved or excited by the transition, playing that out in front of the congregation will not serve you well. 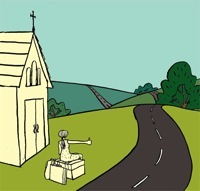 Resource the congregation – Hopefully, your congregation hasn’t been through this very often. Your employment supervisory committee has probably never navigated a transition before, and only a small segment of your congregation may have experienced a pastoral change in the past. Since pastoral transitions are often mishandled, it is likely you will have some who have been wounded by a similar situation, and may be all too eager to share their experience with any who will listen. As one with access to clergy resources, you are likely the best person to research books, articles, and strategies to help the congregation’s leaders navigate this process. I highly recommend Bob Kaylor’s Your Best Move book and webinar (the fee for which includes two copies of the book). He gives great practical advice for the team leading the congregation as well as the outgoing and incoming pastors. If you live in the Colorado area, consider attending one of his transition workshops. If you are out of the area consider contacting him do some consulting for your congregation. You can learn more about these opportunities on his website, BobKaylor.com. Help the pastor and congregation say good-bye well – Encourage your leadership team and others in your congregation to plan a special party to honor the outgoing lead pastor. Give gifts, share memories, tell stories, and generally celebrate the gift of the lead pastor’s years with the congregation. In some ways it will be a very difficult night, but it is an important time for the congregation to grieve and remember together. Be prepared to lead through the “Lame Duck” period – Some lead pastors are not good at saying good-bye. They may just want to disappear in the middle of the night, like the Colts when they moved from Baltimore to Indianapolis. She may get quiet and focused elsewhere. He may not come to the office as much. She may take some vacation time to prepare for the move. He may feel there is no need to continue with ministries you are passionate about. While some things will need to be put on hold while the church’s energy gets focused on the transition, you may need to pick up the slack of a lead pastor who is exiting. Expect to be exceptionally busy during this period, but this too shall pass. In the next post, I will consider your role in welcoming the new lead pastor. ← We are OK. We are not OK. We will be OK.